Had a bad weekend so this MAY be the only thing I have for Friday. I will try to get 16 done and set up as the traditional 16 square Drunkards Path. If I do circles, there will be 36 circles and if I do the traditional Drunkards Path, there will be 9. I also received a 3000 yds cone of periwinkle for the top quilting. I love Superiors "Bottom Line" thread. It's a fine 60 wt thread, eliminates bulk and leaves a nice smooth flat finish. Hopefully I will be adding to this later in the week. OK, now I really feel silly. I did the 16 blocks and when I went to arrange them realized that I was supposed to have had a different cut out pattern if I was going to do the traditional drunkards path. I cut half green pies and half purple L's. For the traditional I would have to have cut 1/4 green pies, 1/4 green L's, 1/4 purple pies and 1/4 purple L's. Oops. Guess I am committed to a circle quilt which WAS the original idea. With the circle quilt I can do a quilt as you go design which will be far easier than trying to quilt an entire queen sized quilt under a home machine. So I guess I'm good to go! 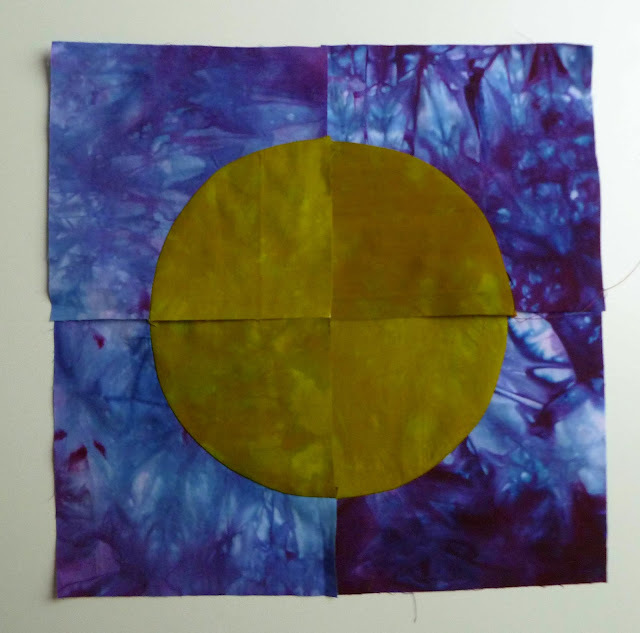 Hope this weekend is better for you, and can't wait to see more about the circle quilt! These colors are really gorgeous! I hope you will have a better weekend now. Lovely colors of your drunkards path. I hope you feel better now!!! This looks great as is. I so want to do a circle quilt - it's on my list! And a QAYG is so much better for you right now. You don't need to struggle over a huge quilt! Best to you!